We begin by taking a tour of this pen. It is immediately obvious that it is also a flower garden. Which came first? After I began clearing this site for a court yard garden, my daughter told me we needed another turtle pen to separate some aggressive males from the females. So the area was fenced in for turtles and a less formal garden was planted more suitable to the needs of the turtles. It is not the formal court yard garden I planned on making. We are pleased with the results and the turtles enjoy this garden. Take a look. So where are the turtles you are wandering. Everywhere. They may be out in the open enjoying the sunshine, just out of sight watching every move we make, or well hidden. We will show turtles, but first more about the pen. Except for the arborvitae bushes in the back, this site was originally covered by wood decking bordered by arborvitae bushes. There was no reason to use the deck because there was no shade from the afternoon sun and nothing to look at except grass. And there is a patio immediately beside the deck. So we decided to remove about half the deck to make room for a flower garden. This was before there was a TurtleTails.com so we only have a few old pictures we can show you. Even before this project was started we had removed some arborvitae bushes, the banisters, and lowered the triangular section of deck. Every board was salvaged for reuse. A generous amount of compost and other organic material was added to the soil and it was graded flat with just enough slop for drainage. The pen was constructed using salvaged lumber and some hardware cloth. Even as a turtle pen this space could be a formal court yard garden, an English cottage garden, a Japanese garden, a vegetable garden, a water garden, or any other type of garden tolerating strong afternoon sun. What we want you to notice most is the location and the amount of plants in it. We want our turtles close to the house where we can enjoy their company when we are outside. This garden is planted mostly with perennials so that we do not have to do much digging with the turtles in it. The plants include perennial flowers, ground covers, bushes, clematis vines, and a flowering dogwood tree. Some of the small leafed ivy came from planters used in aquariums and vivariums. A few annuals and tomato plants also make there way into this garden. We use any plants we want that do not have thorns. Yes we have seen lists of poisonous plants that some say should be avoided in turtle habitats. We have never seen a list of plants that have been proven harmful to turtles if eaten. There are historical stories of people being poisoned by eating box turtles that had eaten mushrooms poisonous to people but not toxic to the turtles. 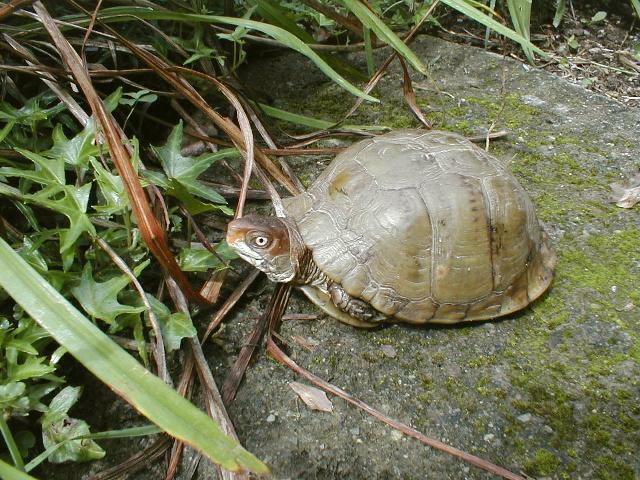 We have never had any turtle health related problems caused by any plants we have placed in our turtle pens. 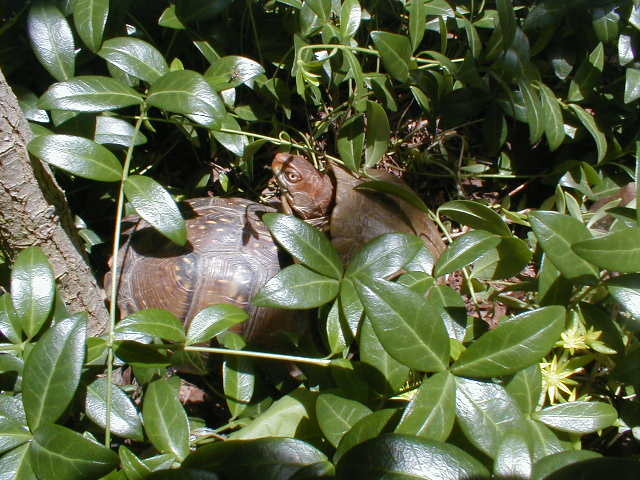 And we have never seen any of our turtles chewing on those "toxic" rhododendron bushes. Like in any garden, we do dig occasionally. We do so carefully. We also have to weed it especially before the nesting season. Usually digging attracts the attention of turtles wanting earthworms and bugs. Some turtles literally get in the way to help themselves. It makes for very pleasant gardening when we are joined by turtles. In the picture at the top of this page, three features are visible; a wading pool, stepping stones, and a step. These are features we wish to call attention to and explain in detail. The wading pool is the result of many tries to build a shallow wading pool for turtles like box turtles that is safe and easy to clean. You can see how it was made in Tour 12 Many Uses for Concrete listed on the Raising Baby Turtles page. This pool requires daily cleaning which is accomplished by using a broom to sweep out the water. Periodically it also requires a scrubbing with a stiff brush and a bleach solution. It only takes one trip with a sprinkling can to fill it. The pool is located where it gets direct sun for several hours. This allows the water to warm. It is also located there it is in an early afternoon shadow to lessen the heat buildup and to lessen the inevitable growth of algae. Our challenge was to build a small pool that can withstand our freezing Pennsylvania winters in place. The aluminum disk as the base for the concrete is a complete success. The pool has weathered several winters without cracking. The spherical shape of the disk is also very easy to level when installing and making adjustments in spring. The third feature is a wood step which is a box made from 2"x6" pressure treated lumber. It sets like an island so that the turtles can travel around all four sides of it and climb onto it, but they cannot use it to climb out of the pen. It is closed on all fours sides so that turtles cannot go under it. It might sound like an open ended box would make a good hide box, but we do not want to take a chance of the step collapsing when we step on it and a turtle being crushed. Occasionally turtles sit on the step to bask so it too is part of their usable habitat. There is also a series of pictures involving the step and pool on the Domesticated Turtles opinion page on the In My Hard Shelled Opinion page which illustrates another function of the step. The step is a good place to sit low among the turtles and socialize with them. Getting down low at their level often initiates a rewarding social encounter that is not experienced when standing towering over them. At the opposite corner of the pen under an arborvitae bush is the feeding station. It was selected because it is convenient to access from outside the pen and heavily shaded. Food stays fresh longer in the shade. It includes a board with two round holes cut in it, one for an 8" flower pot saucer and one for a 6" saucer. The only methodology to this combination is that it worked with the scrap of pressure treated lumber used. Usually both saucers are filled with water and food is placed on dishes or paper plates beside them. Having an established feeding station allows every turtle an equal opportunity to find the food provided. They also know where to sit and wait for food when they are hungry. We take it as an obligation to bring food when a turtle is waiting. It is definitely one of the deliberate ways they communicate with us. The bright yellow dish excites the appetites of the turtles. The first time it was used the turtles tried to eat the dish rather than the food on it. They also quickly learn to associate food with paper plates. We keep a brush hanging on the outside of the wall at the feeding station for cleaning the dishes with water. We are always amazed at the amount of soil in each saucer of water everyday. The amount of soil in these saucers far exceeds the soil tracked into the wading pool. We can only assume that more turtles like the seclusion of these small amounts of water over the more exposed pool. While we think we have provided an ideal wading pool surrounded by plant cover, the turtles favorite water source is obviously the two dishes of water. We experimented with a hide box made from an old clay flower pot. We were surprised to find adult box turtles using it in this pen which we could describe as one big hide box. 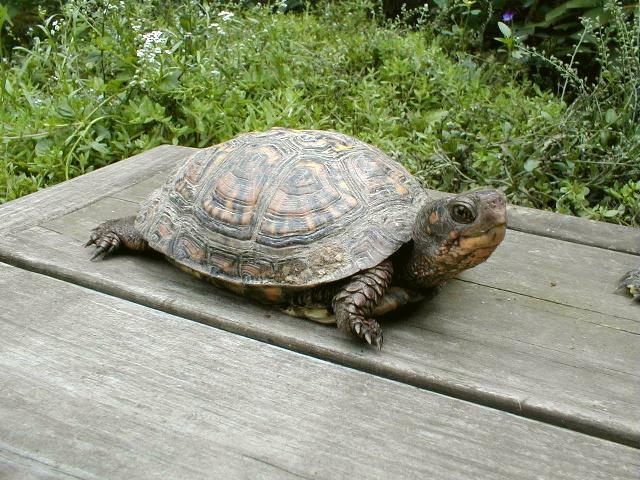 But some box turtles do use it, often two at a time. You can see how we make hide boxes in Tour 17 Hide Boxes for Turtles on the Raising Baby Turtles page. There is a leaf pile behind the arborvitae bushes for use during cool weather but it is not intended for hibernation. While some turtles have hibernated in this pen, it is only because they went underground in the fall and could not be located. The interesting thing about leaf litter in the pen is that we can hear the otherwise quiet turtles moving about. That brings us to the plants in the garden. We have our favorites and the turtles have theirs. Yes there are some plants that seem to be a hit with the turtles evidenced by their use of them. By far the favorite plant of all our turtles is lily-tuff, Liriope. Lily-tuffs form thick tuff grasslike clumps that are indestructible. Some turtles like to sit in the clumps while others dig places to hide at the base of the clumps. We plant them far enough apart so that the turtles can get in between them where they dig in. These plants are so tuff that they take all the punishment the turtles can give them and still flourish. The flowers in fall are an added bonus. Lily-tuffs are also green all winter with the leaves dying back and being quickly replaced in spring. As clumps expand they are thinned by removing half of a clump without removing the remaining half. Another plant that has been a surprising hit with the turtles is a clump of ornamental blue grass. Why this clump of grass invites turtles to use it we will not speculate on. We planted it because it is a real standout and tuff like the lily-tuffs. When a turtle sits on this clump of grass it seems to assume a very proud posture (or maybe they just want us to take pictures of them). Small leafed ivies are very useful. They too form tuff dense clumps that the turtles dig under and climb on. They are easily maintained because they do not spread fast like large leafed ivies more common in gardens. Our ivies were first used in our vivariums and aquarium planters; they are commonly purchased as house plants. Another plant we like to use in turtle pens is sedum. It is soft and grows low to the ground. Some turtles dig under it with surprising speed. While it is easy to tear up, it roots quickly without being buried. Another reason we like to use it is that there always seems to be a supply of bugs in it. 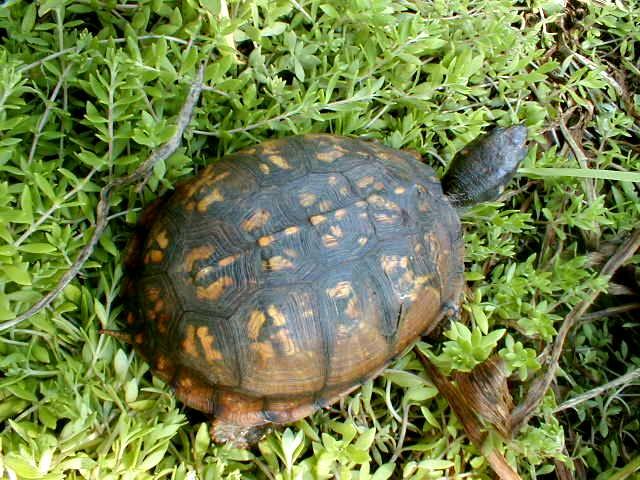 For these reasons it is especially well suited for use with small box turtles. The other plants and bushes in this pen are well represented throughout the other gardens in our yard and are not noteworthy as far as our turtles are concerned. So here are a few more pictures of turtles enjoying their garden home. You have heard the question about which came first, the chicken or the egg. We could talk about our turtle pens in a similar manner. Are our turtle pens gardens or are there gardens in our turtle pens. 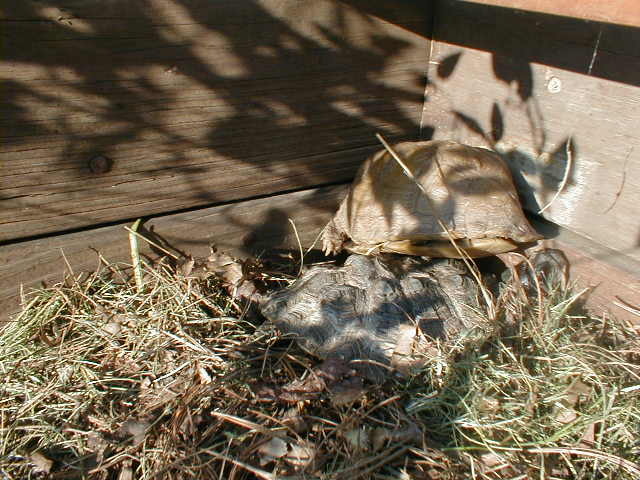 All our outdoor turtle habitats include gardens designed for the use of the turtles and our gardening pleasure. We hope we have inspired you to do lots of gardening in your turtle habitats.